An amazing study from Caltech has demonstrated how moon jellyfish use a unique method of healing themselves to regain symmetry after being injured. The common moon jellyfish, which show up in great numbers along the world’s coasts in the summer, have a strange method of recuperating from injuries. According to a report Discovery News, these jellies don’t generate new limbs when they are lost – they simply shift their body parts around to achieve a new symmetrical state. Moon jellyfish are the first species that have demonstrated what scientists are calling “symmetrization.” Jellyfish are one of the main sources of prey for most sea turtles, and are nibbled at a surprisingly constant rate. A biological study in 2010 showed that at least one third of marine invertebrates, including jellyfish, are living with an injury at any point in time. Abrams and his advisor, professor Lea Goentoro, initially wanted to study the immortal jellyfish, or Turritopsis dohrnii, a species that can revert to its polyp stage. This allows the jellyfish to start the process of maturing into an adult all over again, effectively letting it live forever. While their laboratory waited for specimens to arrive from Japan, Abrams decided to practice his methods with some common moon jellyfish. Abrams started conducting amputation experiments to see how the moon jellyfish reacted. Almost instantly, he discovered that something was not the same about how these jellyfish responded to injury. After losing a limb, the immature moon jellyfish began to rotate their limbs until they were evenly placed around their bodies. Between 72 and 96 percent of the jellyfish examined were able to achieve a perfectly symmetrical form again. Those that failed to regain symmetry developed extra stomachs and floundered at the bottom of the tank. 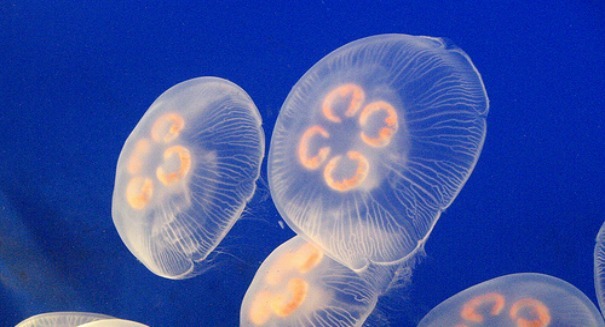 The team found that without any cellular reactions happening, the pulsing movement of the jellyfish was enough to reposition its limbs so that they were more symmetrical. When they were given an anesthetic, the lack of movement prevented the jellies from rearranging themselves.